From dynamic sports to the sudden flutter of a startled bird: the new α77 II stays locked right on target, frame after crisply-focused frame. Building on the heritage of Sony’s much-loved original α77 and α700, the α77 II gives advanced amateurs a string of exciting enhancements in a tough, weather-resistant body that’s up to any challenge. 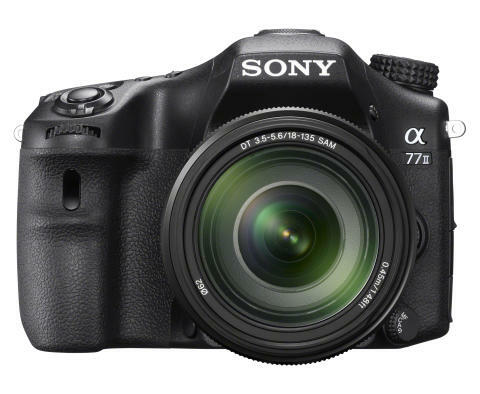 Image quality is boosted while sensitivity is increased by approximately 20% compared to the α77 for flawless, exquisitely-detailed stills and Full HD video, even in low light. Non-stop continuous burst shooting stamina is enhanced and there is a clutch of pro-friendly new video functions for movie makers. Best of all, the α77 II rips up the rule book with an advanced phase detection autofocus system. With approximately 2x wider coverage area than the previous α77 model, it outpaces the AF capabilities of many professional cameras. For the first time ever, the α77 II features no less than 79 autofocus detection points, including 15 cross points within most frequently-used central area of the sensor. This aids super-accurate focusing, even with horizontally-striped subjects that confuse many other cameras. There’s also a dedicated F2.8 AF point placed horizontally in the centre of the sensor. This centrally-mounted sensor supports apertures up to F2.8, ensuring maximum AF precision when using large-aperture lenses. The AF system also performs well in low light, accurately locking onto subjects in scenes with illumination levels as low as EV-2 (ISO100), where even the human eye can struggle to discern fine detail. Vast amounts of metering data from all 79 focus points are processed by a brand new AF algorithm that’s been fine-tuned in extensive field tests. This predicts the subject’s next movement, combining AF metering data together with data on the subject’s position. AF precision is further improved when Lock-on AF is used, recognising the subject from its colour as well as its position in the frame. Whether you’re framing through the viewfinder or on screen in Live View mode, Sony’s unique Translucent Mirror Technology maintains razor-sharp tracking focus on your subject, whether you’re capturing stills or Full HD movies. This powerful new system is less likely to be distracted by other objects – like a rogue balloon moving across your shot at a football match. 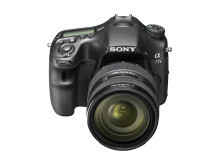 It performs brilliantly in low-light conditions, capturing crisply-focused images of moving subjects on moonlit nights. There’s a suite of sophisticated new AF functions that make the most of the new 79-point system. Expanded Flexible Spot mode maintains focus even if the selected AF point loses track of the subject, activating eight surrounding AF points that recognize the subject. In combination with AF-C AF mode, this dramatically increases performance with moving subject. Lock-on AF mode lets users select one of four AF area modes (Wide, Zone, Flexible Spot or Expanded Flexible Spot). Once its target is acquired, the camera keeps tracking as long as the shutter button remains half-pressed. As the subject moves or framing changes, the camera automatically selects the most appropriate AF point from the 79 available. When subject movement is too fast for the new Expanded Flexible Spot mode alone, it’s combined with Lock-on AF for class-leading tracking performance. For even greater control, the degree of subject-tracking duration can be fine-tuned in five steps (when shooting still images in AF-C mode). With subjects whose movement is predictable, a low setting reduces the risk of the camera focusing on another object suddenly entering the area around the subject. High settings deliver more responsive focusing - ideal when you’re rapidly shooting different subjects at different distances, such as wildlife. AF Tracking Duration can also be selected between High, Medium and Low during Full HD movie shooting. Other new features include an Eye AF function that precisely detects and focuses on the subject’s eyes when photographing people. AF Range Control allows AF to be limited to a specified range, with five AF Tracking Duration settings to optimally match the subject’s motion. There’s a Balanced Emphasis mode that complements the release and focus priority modes by providing the ideal balance between focus and release timing. Users can manually select the most appropriate mode to shoot the situation and their precise creative objectives. Continuous shooting stamina outpaces many professional cameras, too. The α77 II can capture a non-stop burst of up to 60 full-resolution JPEG images at a maximum continuous shooting speed of approximately 12 frames per second (in Continuous Advance Priority AE mode). 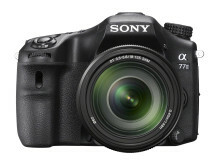 A showcase for Sony’s world-leading expertise in imaging sensing technology, the 24.3 megapixel Exmor™ CMOS image sensor features the same gapless on-chip lens structure as used in the acclaimed α7R and α6000. Thanks to an array of latest-generation imaging innovations, it now offers 20% greater sensitivity than its predecessor that offers the same pixel count. Together with flawless image detail, low-noise performance is assured across a wide sensitivity range of ISO 100 to 25600. 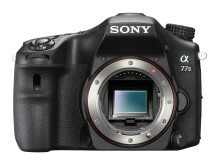 The high-resolution sensor is partnered by the same evolved BIONZ X image processor featured in the α7 and α7R. Around three times faster than Sony’s previous BIONZ engine and optimised for the α77 II, it employs detail reproduction, diffraction-reducing and area-specific noise reduction technologies that contribute to amazing image definition, rich colours and textures with stills and Full HD video. Framing and focusing is a pleasure through the clear, bright XGA OLED Tru-Finder™ with 236,000 dot resolution. With three times higher[v] contrast and resolving power, it faithfully displays exactly what’s in the final image, letting you accurately judge the effects of adjusting focus, exposure and other settings before firing the shutter. A wide viewing angle and high eye-point are complemented by a newly-expanded choice of brightness settings, plus colour temperature adjustment for even more comfortable, accurate composition. As featured on the full-frame α99, the α77 II also features a detail-packed 3.0-type (7.5 cm) Xtra Fine LCD that moves three ways for near-limitless creative flexibility. Easily shoot from high or low angles, in portrait or landscape orientation, handheld or with a tripod. WhiteMagic technology significantly improves screen visibility, even outdoors in direct sunshine. Evolved from the original α77, separate control dials in front of the grip and behind it allow intuitive, fumble-free adjustment of camera settings without taking your eye away from the viewfinder. Lavish customisation options now allow a total of 51 functions to be assigned to 11 buttons. Up to three frequently used groups of shooting mode and other settings can be stored in memory and recalled easily via the mode dial. 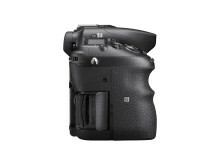 In addition, an exposure mode dial lock function has been inherited from the a99 to prevent accidental mode changes. The tough, light magnesium body of the α77 II is engineered to withstand the demands of serious enthusiasts in search of that perfect shot. Positive, comfortable handling is enhanced by the large, contoured grip. Dust- and moisture-resistant seals around main buttons and controls are complemented by double-layered protection around all openings including media slot and terminals. In addition, the camera’s durable shutter unit is rated for 150,000 activations. 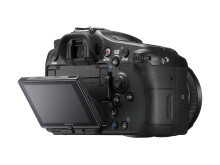 The a77 II can record Full HD 60p and 24p movies using the AVCHD 2.0 format. As with still shooting, Translucent Mirror Technology enables full-time phase-detection AF, ensuring accurate focus tracking with fast-moving subjects while you’re capturing video. 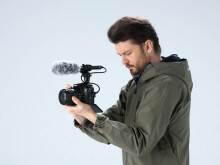 A number of advanced features appeal directly to serious moviemakers, including three-level AF tracking sensitivity adjustment, a pro-style Zebra function and audio level metering. There’s also the addition of a clean HDMI output that allows viewing on an external monitor and recording without compression to an external storage device. On-board Wi-Fi allows one-touch connection for easy shot sharing with your Xperia™, NFC-compatible Android smartphones, tablets and VAIO. A single touch also activates Smart Remote Control, linking the camera to your mobile phone enabling you to fire the shutter from a distance. Covering focal lengths from wide angle to telephoto, a family of 32 A-mount lenses offers an extensive choice of creative tools for visual expression. The line-up includes glassware to fulfil just about every artistic need, from high-performance G Lens™ and ZEISS® models that deliver world-class quality to the unique Sony STF (Smooth Trans Focus) lens that produces extraordinarily smooth background bokeh. Premium G Lens models feature precision aspherical lenses, ED (Extra-low Dispersion) glass, an advanced Nano AR Coating and other advanced Sony optical technologies that contribute to high resolution while also enabling beautiful bokeh effects. ZEISS® lenses are jointly developed by Sony and ZEISS, a name that is well known to discerning photographers worldwide, making full use innovative and ground-breaking optical technologies. Superb contrast and high resolution that extend right to the edge of the frame are highly famous hallmarks of the ZEISS brand. The optional VG-C77AM grip enhances camera operability by offering remarkable holding and operational ease during vertical shooting. Sony has also today released a new “α Library” application for tablets which includes two types of content. “α Lens catalog” showcases the entire line up of α lenses and provides key information and specifications about which lenses are best suited to different types of photography. The bi-annual “α Magazine” showcases the boundless fun of photography. The new α Library is available for download on Google Play and the iOS App Store from today. 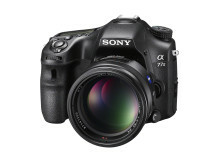 The α77 II A-mount interchangeable lens digital camera from Sony is available to pre-order now fromwww.sony.co.uk. It’s on general sale in Europe from Summer 2014. XGA OLED, 1.3 cm (0.5 type) electronic viewfinder (2,359,296 dots effective resolution), with 100% frame coverage, five display modes and grid line display modes. 7.5 cm (3.0-type) wide type TFT with WhiteMagic technology. Tilt angle: 150 degrees upward and 180 degrees downward. Rotation angle: 180 degrees clockwise and 90 degrees counter-clockwise. [i] As of press release date. 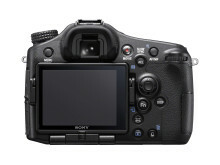 Sony survey of interchangeable lens digital cameras with dedicated phase-detection AF sensors. [ii] Actual number of AF points used depends on lens and shooting mode. [iii] Quality set to “FINE” and image size set to “L”.